Glen Keith Scotch Whisky Distillery was built in 1957 in the Speyside region of Scotland. This distillery has close links to the Strathisla Distillery and if you are wanting to gain access to the distillery using the Passport Experience you will need to go through this distillery. 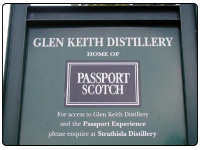 This distillery is now closed as of 2000, but did produced Glen Keith 10 Year Old and Glen Keith 1983. There contact details were Glen Keith Distillery, Keith, Banffshire, AB55 3BU.